… or at least I hope to, once I get used to my new varifocal glasses. Finally I have had to accept that constantly taking my glasses off, or pushing them up into my hair is no way to continue with my crafting activities. Having been short-sighted and worn glasses since I was six or seven, it was a very strange experience to discover that, for some things, my sight was better without my glasses. Fiddly crocheting and threading needles were only possible with the naked eye, resulting in a strange sort of macramé involving yarn, my hair and my glasses and sometimes a hair grip and a crochet hook. It was all getting too much like making a shamble (sensu Terry Pratchett) and since my aim was wool craft not witch craft I finally decided that a trip to the optician’s was in order. And so, this morning I came home with my new glasses and the hope that I will now know what characters look like on the TV rather than just what they sound like because I will be able to focus on the screen and my crochet/knitting without the whole removing/deploying glasses malarkey. Currently it’s going well – I am able to use my computer without undue head movement and I walked the dogs without tripping. I am warned that stairs may be tricky, but if I have problems with those tonight then things are really bad because we don’t have any and it will mean I’ve wandered into the wrong house! What this has brought home to me is how marvellous technology is. It’s not all that long ago that my poor eyesight would have made me pretty useless – unable to see anything further away than my own hand and only able to do handicrafts in good light. Now, however, with the aid of modern lenses and a great work light with a ring of LEDs and a built-in magnifier, I can function as a productive human being. Of course it’s not so long ago that my gender would also have prevented me from doing lots of the things that I now take for granted, and sadly this is still the case for many women. It strikes me that we all have so much potential to do good and make positive changes in the world. What a tragedy that not everyone gets that opportunity to fulfil their potential, whatever the reason – gender, colour, language, sexuality, physical limitations… Wouldn’t it be marvellous if we could all see the world through a lens that revealed everyone’s skills and abilities? And then, perhaps, we could get on and make the most of caring for this wonderful world in which we live. Beautifully said. It’s astonishing how far we’ve come in a short time, yet how far behind we remain. Simply by chance of birth, it’s a gift to be born in the developed world. My heart aches with every news story of Syrian refugees crossing, or trying to cross, the borders, women in peril in Afghanistan and the challenge for human rights across the globe. I like your symbol of hope: that beautiful, aqua dragon. That’s Arthur, Mrs P’s dragon… he flew all the way round the world to be with her… a symbol of friendship… and I got one of her lovely pictures in return. Ah…Yes, now I remember.What a beautiful exchange all around. There’s my Welsh Sea Dragon Arthur starring as your symbol of hope – that is so lovely!! It made me go and give him a hug!! He is perched high up so the puppy can’t ‘love’ him to pieces [literally] sitting astride a giant quartz crystal and looking quite glam really. Hooray for the new specs. One of the unsung blessings of growing older is that our eyesight often gets better. Mine did and I went from having to wear glasses when driving to not having to any more at all. I now wear glasses for close work and reading at night time and that is pretty much it. I seem to be better with these new ones… I’ve just been working on the sofa cover (yes, I’m still at it!) and didn’t have to get spectacles entangled in hair even once!! We take too much for granted. Thanks for the gentle reminder. My optician also pointed out that if you try to watch the TV whilst lying on your side on the sofa they don’t work… I tried just to make sure and he is right!! So no odalisque-style reclinery chez Snail then, only proper upright viewing! … and I was looking forward to a spot of languishing!! If I were to lie down to watch TV, I’d inevitably fall asleep, so perhaps it’s just as well my specs don’t let me! I’m crossing my fingers that someone develops that lens now you’ve suggested it. 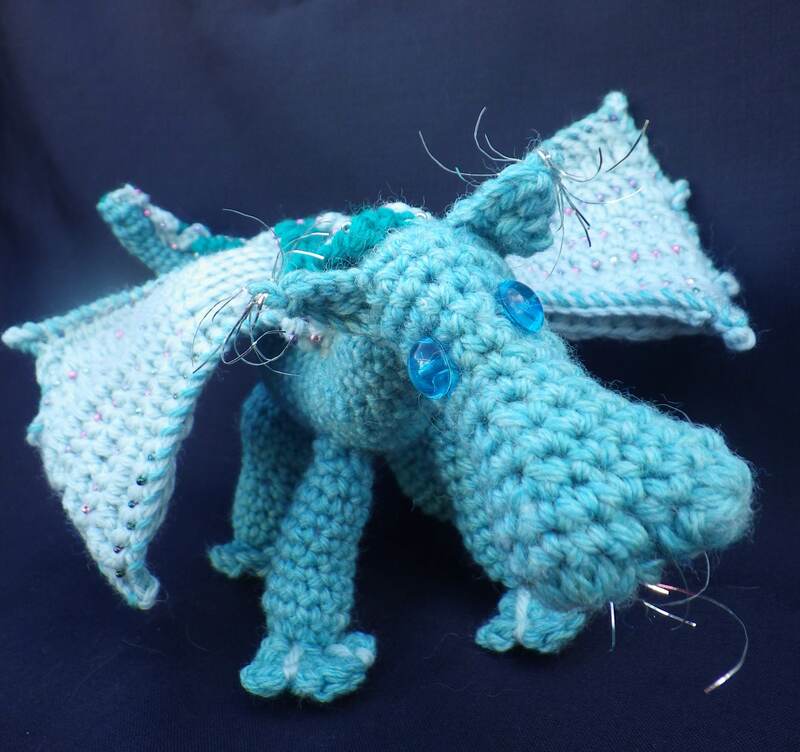 I smiled when I saw your little dragon and smiled even more when I read your post! Like you, I have worn glasses since I was 7 and I am very short sighted. Having been able to do tiny sewing stitches with my glasses, it was a terrible shock to find that I had to take my glasses OFF to sew. I have varifocals too. They help, but I still have glasses with the whole lens dedicated to close work. The worst problem I have is that when I take photos I still take my glasses off to see the viewfinder clearly. Instead of putting the glasses on my head, I hold them between my teeth! Trust me, glasses pitted with teeth marks is not a good look! I have been wondering about crocheting myself a cord for them… at least then I could just slip them off and not think about it. As for Arthur, the dragon, he’s now in New Zealand. He has a sibling in Tasmania, but there isn’t one in the UK!! Here here!!!! and hurray for technology! You made me laugh when you mentioned being in the wrong house if there were troubling stairs. New glasses always make the brain work a little harder for a few days. I’m waiting to get some as well since right now everything is blurry. Like you, I’ve been wearing glasses since age of 6. They told my mother I’d be blind by 21. Ha! Little did they know then that technology would rush in and save me. At 67, doing anything is a struggle but good light, magnifiers and some wonderful tools like needle threaders, I can still participate in creative endeavors. My favorite part of this post is this line, “if we could all see the world through a lens that revealed everyone’s skills and abilities?” Well said.